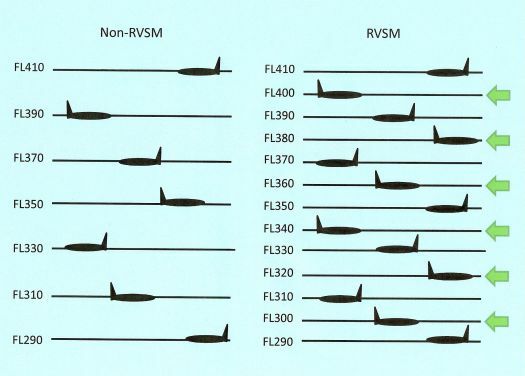 Reduced Vertical Separation Minimum (RVSM) was introduced to reduce the vertical separation above flight level (FL) 290 from the traditional 2000-ft minimum to 1000-ft minimum. This allows aircraft to fly more fuel optimum profiles, increases airspace capacity and reduces in-flight delays by providing six additional cruising levels between FL290 and FL410. All aircraft operators intending to fly within RVSM applied Flight Levels (FLs) are required to be registered with the JASMA. All aircraft are required to be certified for RVSM airworthiness by the State aviation authority where the operator is registered. The operators who operate in RVSM applied airspace are required to participate in the ongoing monitoring program. The JASMA has responsibility for the provision of monitoring and safety assessment activities in Fukuoka FIR, and maintain an database of RVSM approval aircraft. Receive RVSM airworthiness approval from State CAA. Upon receiving airworthiness approval, the aircraft is qualified for height keeping performance monitoring. ACCs providing ATC service within RVSM airspace may clear non-RVSM approved aircraft to climb or descend through RVSM airspace. Such climbs or descents shall be achieved before the aircraft passes the transfer of control point to the adjacent ACC, if applicable, unless otherwise specified in an inter-ACC letter of agreement. An RVSM Large Height Deviation (LHD) is defined as any vertical deviation of 90 metres/300 feet or more from the flight level expected to be occupied by the flight. All LHDs must be reported to the JASMA; this includes those due to TCAS, turbulence and contingency events.